For Weekend America's Halloween show this year, Tales of Terror, they invited some writers to come up with scary stories that last no longer than half a minute. This year, they have an interesting line-up of storytellers: David Rakoff, Dana Gould, comics creator Richard Sala, a children's book writer, a horror writer, all adhering to the strict 30 seconds or less rule. It's on the air today or found online here. Here's last year's edition, which featured Neil Gaiman among others. 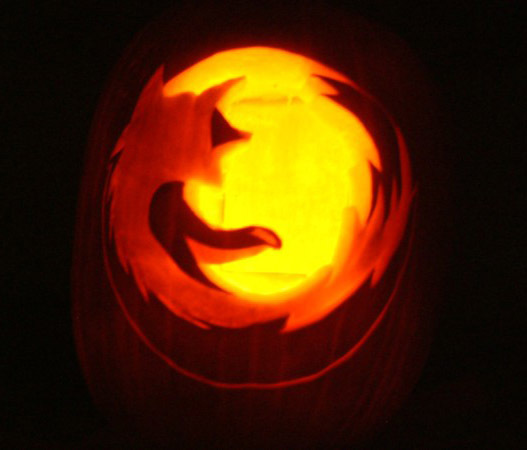 Wired magazine is looking for your geekiest jack o'lanterns. If you don't have one but want one, read this tutorial. Fake blood needs to be sticky and goopy. Start with 1 cup of clear corn syrup. Add a few drops of red food coloring and one drop of green to create a nice dark-red blood that's safe and nontoxic. To imitate foamy blood (as it might appear in a sucking chest wound), replace half the corn syrup with clear dishwashing liquid. Place this spooky gargoyle outside and watch him at night as his eyes light up, giving your yard a spooky, haunting look. A great decoration, indoors or outdoors, for Halloween or even all year round. Made of weather resistant poly-resin and is wonderfully detailed. 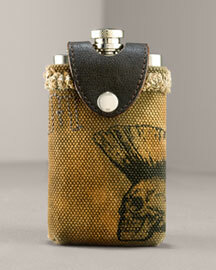 Stands 8 inches tall. 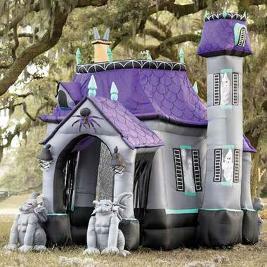 Standing an impressive 12 1/2'H, our castle is guarded by gargoyles with glowing eyes and spooky ghosts waving from the windows. Step in, and suspended spiders and bats with flashing eyes greet you. Strobe lights synchronized with creepy sounds add to the fun. Escape through side entrance or back foyer. Self-inflates in minutes and includes stakes, tethers, and fan. Simply unplug to deflate. Stores neatly back in the box. Light and sound effects require four AA batteries (not included). Approximately 10 1/2'W x 12 1/2'H x 12'D. 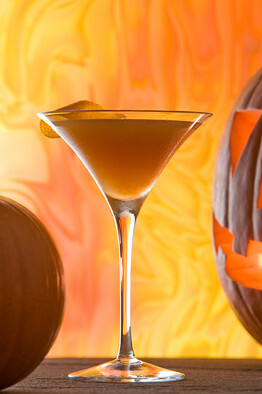 What's better than a pumpkin carriage? A pumpkin swing! Artists Carolyn Fletcher and Stevy Myburgh created the $25,500 swing from recycled copper. It weighs about 290 pounds. It won't carry you to the ball, but it will make for a great princess nap in your backyard. For $1,700 more you can buy a full circular stand. Pumpkin Swing accessories include: a 12v light fitting, Interior lights, alcoves with night light holders and a music box. Growing a giant pumpkin has become an annual quest for some. Enthusiasts are growing thousand-pound pumpkins in their backyard gardens. Competitive pumpkin growing has become so popular that Outside magazine did an article on the subject several years ago. In 1900, William Warnock of Goderich, Ontario, grew a 400-pound pumpkin that he showed off at the World Fair in Paris. He held the rworld ecord until 1976, when a Pennsylvanian exhibited a 451-pound pumpkin at the U.S. Pumpkin Contest. Now, competitors are trying for a 1,000-pound pumpkin. Some have even hit the scale at heavier weights. 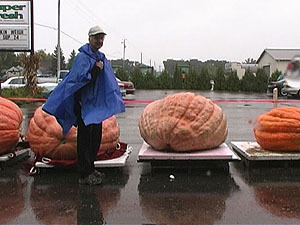 Most recently, Ron Wallace won the world record for largest pumpkin with a 1,502-pound specimen on Oct. 7, 2006. That beat out Larry Checkon, who had hit a record the previous year with a 1,468-pound pumpkin. 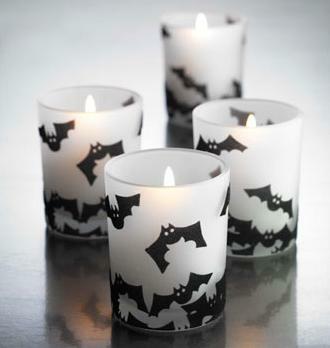 These frosted votives are flocked with fuzzy bats to set an eerie mood for your Halloween bash. A great addition to bring to your haunted house!